It’s hard to believe she’s just starting her senior year of high school. But Mackenzie Moore has an old soul, and it comes out in her music. The Roxbury/Sauk City native has been writing her own songs for a while, and recently released her first album, “Veins,” with the support of some local musicians she met when she attended Girls Rock Camp Madison. But Mackenzie is just getting started, and she talked with me about her inspiration, what to expect when you go to one of her shows, and why her goal really isn’t that far out of reach. Maximum Ink: You started playing guitar more than 10 years ago. What inspired you to pick up a guitar? Mackenzie Moore: I initially got into music by listening to classic rock radio, and my parents’ C.D.’s. My mom played guitar for a while when she was in elementary and middle school, so when I started at 7, I used her same classical guitar from the early 70’s. By the way, on her side of the family, Journey is the band! So Neal Schon, the lead guitarist, was, and is, one of my favorite guitar players. I started going over to the house of a family friend to learn songs on guitar when I was in 4th grade—he was in high school—and once I got a song down on guitar, he’d drum along to it, so that was my first experience hearing live drums. The first song we played was “Everlong” by the Foo Fighters, but I was already hooked! Our friend sold me his drum set when I was 15. So my biggest influence since that time is Dave Grohl. I did have a little stint as a percussionist in the school band, but I stopped after one year because quietly playing a drum kit for a couple of minutes before band practice wasn’t quite cutting it for me. MI: You quit band at school, but went to Girls Rock Camp in Madison. How did the experience change the way you look at music? MM: Music really became my focus when I realized I didn’t care enough about sports to be super competitive. 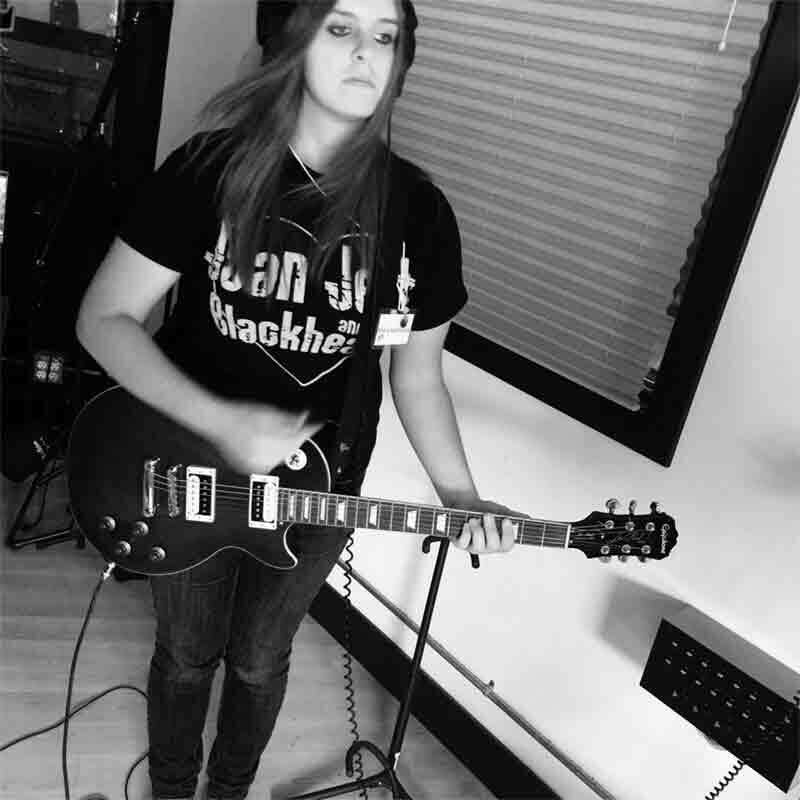 I attended Girls Rock Camp, and it played a huge part in creating the interest I have in writing and playing, and making music a career goal, too. Girls Rock Camp has also taught me about the steps in-between playing for myself at home, playing for a small, intimate audience, and playing for thousands in a stadium. It also became my connection to the many talented female musicians in the area. And really, at the time, the only women influences for me were Joan Jett and Sheryl Crow. The relationships from Girls Rock Camp are why my life is the way it is, both personally, and professionally. People often like to say they can’t imagine their life without something. I genuinely can’t imagine my life if I had never gone to Girls Rock Camp. MI: Tell me a little more about where you are right now. You are a senior in high school, but you are also taking college course, so where do you see yourself going after graduation? MM: Technically, I’m from Roxbury, but it’s a strange spot where I have a Sauk City address. I accept both as my hometown. It’s a great place to experience everything a small town has to offer, for better or worse. Plus, it’s beautiful, and a nice place to grow up. Of course Madison, on the other hand, has a lot more going on, which is something I need and love. But it’s also tough to know there’s work I really want to do, but can’t, because I’m not yet at the age where I have the freedom necessary to do it. I really wish I could go from state to state in a van right now and gain some footing nationally, but I’ll have to wait a bit for it. I am trying to appreciate where I am right now, while still looking at how much more work there is to do in the future. MI: What’s a current Mackenzie Moore show like? MM: The vast majority of my shows are completely solo—me, a PA, and my guitar. My sets are usually 2-3 hours of acoustic covers along with my originals, and often with one or no breaks. My covers include songs from Tom Petty, Sheryl Crow, Foo Fighters, Lissie, Chris Stapleton, Nirvana, and Simon & Garfunkel. I also play a couple of songs from a former local band that is no longer together, Little Red Wolf. MI: Our mutual friend, Meghan Rose, was in Little Red Wolf! She moved to NYC, but gets back to Madison pretty often. How did she help support your first album? MM: Mannequin, the first track off of Veins, is very sentimental to me. I was at an album release show for Meghan Rose in 2016, and she said she wanted to record a song with me at Clutch Sound before she moved to New York. We did my song just a few days later. It’s funny because the first real conversation I had with her a few years earlier was about Clutch Sound, and its history as Smart Studios, so it felt like we came full circle. The rest of the album I wrote—the lyrics, melodies, and guitar parts—over the last four years. I recorded the final 4 songs in the early spring of 2018 with Jenna Joanis and Beth Kille. The environment was very relaxed, and I felt calm knowing that my songs were in good hands. Plus, Beth kept her dog there for me, which was a big bonus. MI: You must be proud of all you’ve already accomplished, and especially putting out your own album. So what’s next for you? MM: Right now, I feel proud whenever I get feedback from music fans in Madison! Because of my age, where I live, and my own show schedule, I don’t get to support as many gigs played by other musicians as I would like, so when I do get to go to one and I meet somebody, it’s reaffirming when I introduce myself and they end up knowing who I am, or even have heard my music. It’s always cool to hear you may be making a buzz on the scene! But, my ultimate goal is to make enough money through my music to live comfortably. I’m already meeting lots of interesting people I wouldn’t be exposed to in most other lines of work! And my songwriting is changing direction. It’s become a little more like my early influences like Lissie, Sheryl Crow, Skylar Grey, and Melissa Etheridge. It feels really comfortable, so I plan on sticking with it for now. MI: We talked about school earlier. How do you find time for everything you are trying to do? MM: I’m a high school senior in the morning, and a college freshman in the afternoon. I did have a part-time job, but quit a few months ago to focus on music. I spend a lot of time after school trying to connect with people to book shows as a D.I.Y. musician! MI: Anything we may be surprised to learn about you? MM: I have an English Cream Golden Retriever puppy. I officially named him Bucky-Buckingham, a combination of Madison and music. But I think it’s more fun to call him Buckaroo, or Buckingham the Peanut Butter Man. Find all of Mackenzie shows listed on her official Facebook page, Mackenzie Moore Music. Her next show is September 7th at Village Pub in Sauk City, followed by one on September 14th at Up North Bar in Madison. More shows are listed in the events section of her page. Her music is available on all streaming platforms.